Please note that this is an alpha! It is mostly complete but there are bugs, both known and unknown. DO NOT install this if you depend on Paint.NET for your livelihood, for instance, as it might crash at seemingly random times or even corrupt your data (that’s actually very unlikely but, still, use caution). After alpha comes beta, and then final (general availability) or "RTW" (release to web) (also sometimes called RTM). NOTE: The alpha is not available via the updater in v3.5.11, even if you have “Also check for pre-release (beta) versions” enabled. The beta for 4.0, however, will be made available through that update channel (from v3.5.11, I mean). I’m deliberately doing this in order to keep the audience size smaller for now so that my inbox doesn’t get flooded (I’m also not advertising it on the paint.net website just yet). Newer 4.0 alpha builds will, of course, be automatically offered to you once you have any 4.0 alpha installed. The behavior always occurs in Replace mode, and in all modes such as Add and Subtract when the entirity of the rectangle being dragged is above everything already selected. There are some other weird behaviors but I suspect they're from the same root cause and won't bother explaining the exact (more complicated) repro steps unless necessary. Yup. I've got a bug filed for that one! shouldn't the image be displayed when you hover the mouse ober the superbar windows? Update did not work. After the update package was downloaded and started nothing happened. 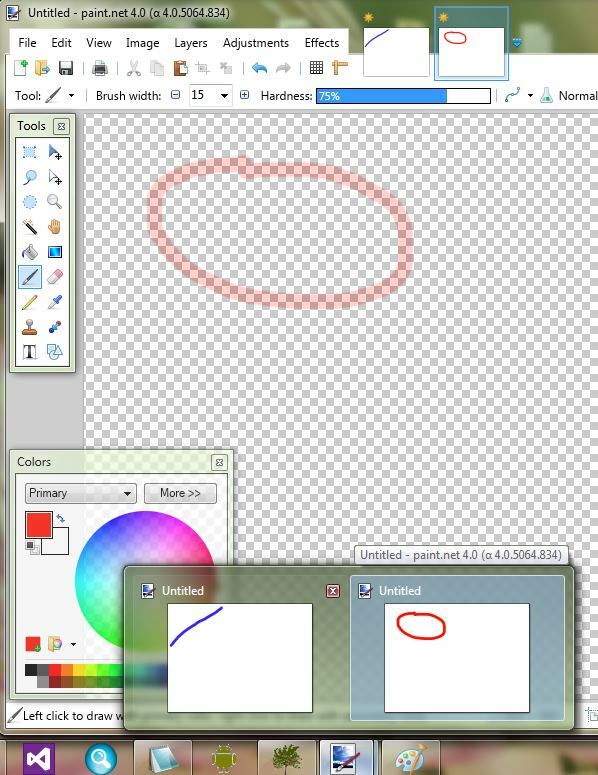 Started paint.net and was still at the old alpha. So I thought uninstall did not work. Manually uninstalled, downloaded the alpha and started the install. Was told that SetupShim could not be written. killed it. Restarted Setup, which hang again with an invisible SetupShim.exe. Rebooted and then the new Setup succeeded. This is on a fully patched Win 8.1 Pro x64. I also have a problem with anti-aliasing. The only window where I don't have blurry text is Settings/Diagnostics. When I use the text tool it looks even worse. 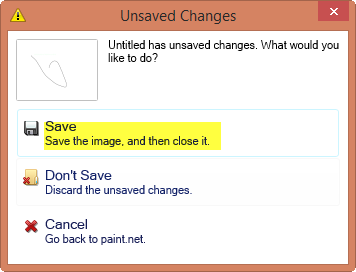 Paint.net should use the system settings in the UI, and it should have some configurable option for the text tool. I would like to have anti-aliased text in the image, so just disabling it wouldn't be enough. The Text tool should render text that looks the same as 3.5 did. For the text tool: look in the command bar: you can disable anti aliasing from the toggle button (third from right, the curved line). Just like Rick said, the text painting tool didn't change but the way the GUI text is drawn. Using the bracket [ ] keys to increase works for singles both up and down, but the increase by 5 only works increasing the number, not decreasing it. When one undock and re-arrange the windows (tools, layer, color), close program and then reopen it, it doesn't remember the last/previous layout settings. ... and if I could wish for one thing, it is to be able to have text saved as text, so it could be editable when reopen the file. And if it does need to be in it's own layer, it wouldn't matter as long as it is editable. May I point you to this post? Ability to re-edit text, or "text layers", or some variation thereof -- This an enormous work item due to other plumbing that must be in place to enable it. This falls into the "yes I agree, and hopefully we'll have it someday." No solid ETA, and definitely a 4.0 or post-4.5 feature. This is getting closer to reality, so hang in there. Make sure you read the rules before posting. :-) Welcome to the forum! This seems like the place to report bugs, from what I can tell? If not, I'm not sure where, but I'm happy to post elsewhere. My Nvidia GeForce GT 420M seems to have a hard time with extra tails on the paintbrush, eraser, clone stamp and recolor tools. As far as I can tell, no others are effected. Additionally, this problem does not arise on the integrated graphics. The first screenshot (mostly black) is when the program is first opened, the second is after a different program has been switched the foreground and back to PDN, which makes all of the darkness go away. Loving it so far, but I just found the 4.0 alpha today. Just a suggestion. I keep my control boxes (color, layers, etc.) at the four corners. Still it really annoys me how when I'm zoom in I can't scroll anything except to the sides. I can't, for example, scroll to put a side in the more middle of my screen so I can work on it and not be blocked by my control boxes when doing detailed work. Hey, 4.0 looking good. Just updated to this and went to use the straight line tool, got a crash. System.InvalidOperationException: Visual Styles-related operation resulted in an error because no visual style is currently active. I used an image of size 1920x1080. I wanted to select a rectangle from the upper left corner, of size 1600x900. So I used the Rectangle Select tool, set it to Fixed Ratio of Width 16 by Height 9. (I know I could have set it to Fixed Size, but that is not the point). I then clicked somewhere left and above the upper left corner, and dragged the mouse to cursor position 1600, 900 as indicated in the status bar. The selected rectangle was 1597x900, instead of the expected 1600x900. Note that my screen is 1920x1080, and I was working in Zoom to Window mode (81%). I cannot scroll horizontally by using my touchpad (two finger slide) or by using the side scroll of my mouse wheel. It works in other apps and I'm sure id had worked in 3.5, as i often zoom in and scroll with the mouse wheel. I think McLoo meant "cannot scroll". 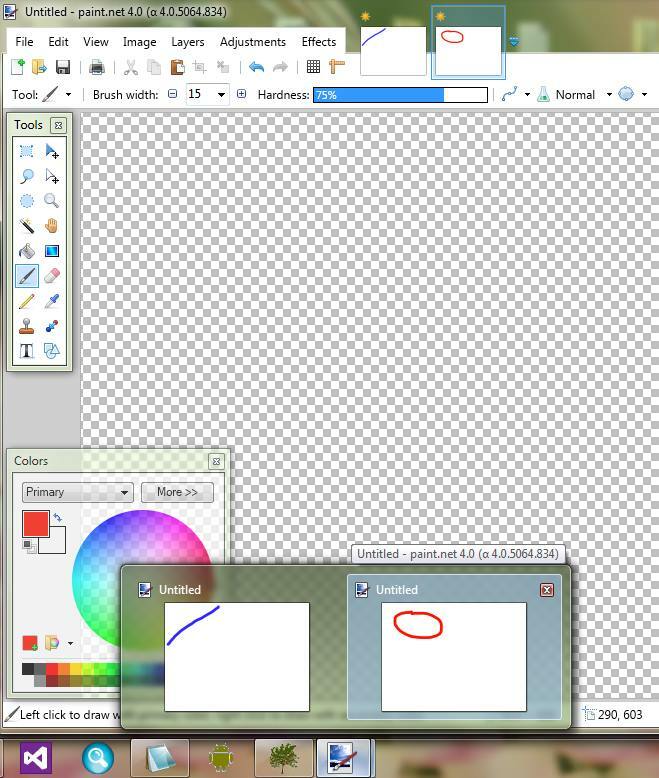 And I see the same here with an alps touchpad which scrolls vertically in Paint.Net but not horizontally. In other apps horizontal works. The zoom messed it up. It look good at 100%. My bad! 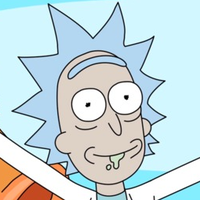 Rick, I know that your goal is to have Paint.NET 4.0 released by late 2013 or early 2014. How well is that release window looking? I'm just eager for it to finally release. I appreciate all the hard work. +1. For me it seems to be caused by enabling hardware acceleration in the settings window. Apparently, pressing Enter or Escape will not disable selections unless the "move selection" tool is active. Is there a reason for that? I'm used to being able to deselect stuff any time I want.